The first thing you will need to do is create a separate certificate template to create the SCCM client certificate to be used for your workgroup computers. Open the Certification Authority console, right-click Certificate Templates, and then click Manage to load the Certificate Templates management console. In the Properties of New Template dialog box, on the General tab, enter a template name to generate the client certificates that will be used on Configuration Manager client computers, such as ConfigMgr WG Client Certificate. Click the Subject Name tab, select Supply in the request. Click the Request Handling tab, tick the box to allow the private key to be exported. Click the Security tab, remove Domain Computers, add in your Domain User Account or any other account which will be used to generate the client certificate for the workgroup computer and select the additional permissions of Enroll. You will use this account later when you need to generate the certificate for the workgroup computer. You will logon to http://certserver/certsrv with it. In the Enable Certificate Templates dialog box, select the new template you have just created, ConfigMgr WG Client Certificate, and then click OK. Create and submit a request to this CA. Leave the rest default, click next. Because the certificate will end up in the user certificate store of the workgroup computer, you will need to export it from there and import it into the local computer certificate store. 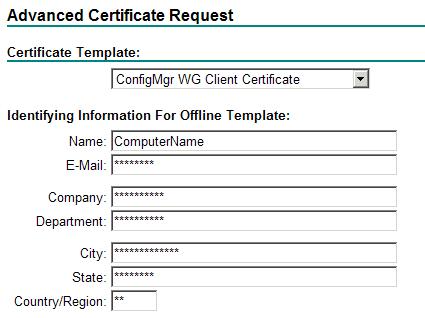 Open the Certificates MMC console for the user account > Expand the Personal store > Click on Certificates > Right click on the certificate and export. Browse to a location for the file and give a name, the file will have a .PFX extension. Import Process – Open the Certificates MMC console for the computer account > Right click on the Personal store and choose Import > browse to the certificate you just exported. As your workgroup computer is not on the domain, you will need to allow the workgroup computer to trust your CA environment. The easiest way to do this is to copy the Root CA’s AIA certificate to the workgroup computer, this certificate can be found in the Root CA’s AIA location which is generally %windir%\System32\certsrv\CertEnroll on the certificate server and it will end in .CRT. Once it’s copied to the workgroup computer, open the Certificates MMC console for the computer account > Right click on Trusted Root Certification Authorities and choose Import > browse to the Root CA’s certificate you just copied. do you know if there is a way to automate this with certutil or any other utils?